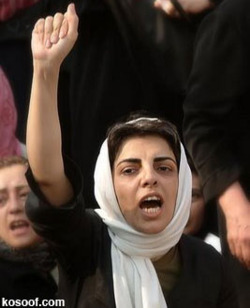 Ardalan is a feminist activist writer based in Tehran, Iran. In 2007 she was awarded the Olof Palme Prize for her struggle for gender equality. Along with other feminist writters, ignoring the threats of the Tehran religious-police, she has helped set up the Women’s Cultural Centre in Tehran. This is with the aim to promote women`s issues in Iran. She has been imprisoned for her work. Ardalan is one of the founding members of the One Million Signatures campaign, attempting to collect a million signatures for women’s equal rights. The Sunday Cat Disputes the Association of Doves with Peace.